Many ‘thanks’ to the good folks at Trinity Lutheran College in Everett, WA. Their community outreach programming included an engaging and really cool roof top garden at their parking garage in downtown Everett. With inspiring views and lots of space, a curriculum for care and share were most evident in the layout. A new life for their dreams continues with this donation. When the reality of closure this year for their decades long educational endeavor became finalized, administrators looked to give their ‘outreach tools’ a new life. 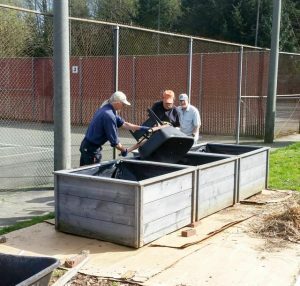 Networking with Lutheran Churches to harvest a new beginning for their garden planters, MC2 stepped up and said, ‘yes, MCGO can use these sturdy planters’. Getting consensus from all was the process followed. Fast forward to today and all the heavy lifting is complete. 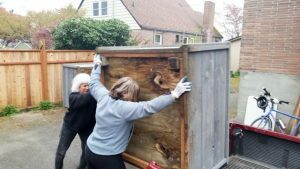 Staged at the local Lutheran church (Maple Leaf in Meadowbrook), MCGO community members muscled up and got the wood boxes set up at the community garden. Having containers at a working level is one of the highlights to the donation. It also gives community gardeners another place to grow NW veggies and fruit. 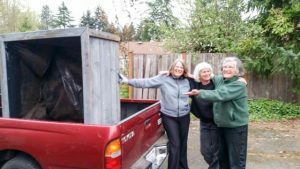 Once garden steward Sue M rallied community volunteers, the fun began. 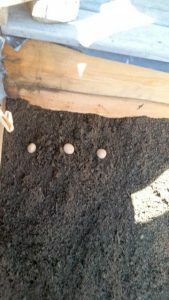 Soil and spuds got the growing process started. Once full with soil and potatoes do get harvested, new plantings will be planned for this ‘big box’ space. Located next to the tennis courts, it is a very visible opportunity to learn about region appropriate plantings. Percentages of all harvest are taken to the North Helpline in Lake City. 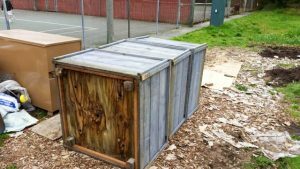 Located next to the Lake City / Fred Meyer Store, donation time has restricted hours so visit www.northhelpline.org to schedule your garden donation. women at work! good work!